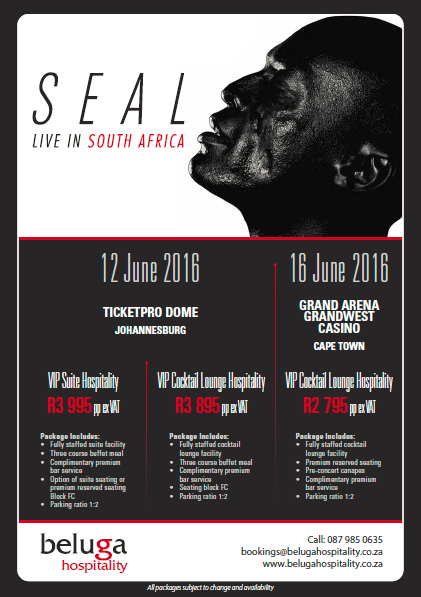 The ‘Kiss from a Rose’ hitmaker Seal will be performing in the country in June. Book your VIP hospitality tickets at the Ticketpro Dome for 12 June or GrandWest Casino for 16 June. Seal has sold more than 30 million albums worldwide and released a total of nine studio albums in his career so far. His inimitable voice was first heard on Adamski`s 1991 club smash `Killer` and another Top 10 hit `Crazy` arrived shortly thereafter as Seal went on to achieve global acclaim with his debut. Seal has won many music awards throughout his career. In 2012, Seal was one of the four vocal coaches in the first season of the Australian version of the reality singing competition The Voice and coached the series winner Karise Eden. Seal returned to The Voice in season two where he became the winning coach once again with winner Harrison Craig. On his latest album release `7` Seal commented, `it concerns the most sung about, most talked about and most documented emotion – love`.